Wednesday nights, if I can help it, I’ll be at home watching TV to watch my new favourite show, “Extreme Makeover Home Edition”. Considering I’ve only seen it twice (blame it on my EXTREMELY busy schedule), I’ve been hooked! The first time I watched it, they featured the Cadigan-Scott Family Season 1, Episode 12). The family lost their Mom as a result of a heart attack, then 2 weeks later, their Dad died a heart attack as well. Their eight kids were left to grieve a double, unbelievable loss. The two oldest siblings had to move back home and assume legal guardianship of the younger siblings, or else they would end up in foster care. The second time I watched the show, they featured the Garay family (Season 2, Episode 2). The story was, a mother was shot and killed by a gang member's stray bullet while sleeping, leaving 5 young kids (David, 12, eleven-year-old twins Nidia and Efren, Eric, six, and three-year-old Celina Cleto). The eldest son, Johnny Garay, who works for a non-profit agency and coaches at-risk teens, took in his five younger siblings so that they would not be separated by Child Protective Services. He took in his siblings, though he and his wife Veronica had four young children of their own (Christina, nine, seven-year-old twins Iris and Johnnie, and Freddy, three). They needed space to fit everyone so Johnny moved his now large family into what he could afford, a major fixer-upper in the South Central area of Los Angeles, California. The house was in terrible shape, and they actually already had orders from the city to make some major repairs or else the kids would be taken away to foster care. 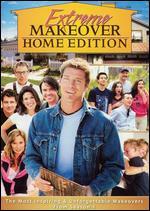 Extreme Makeover: Home Edition and their design team to the rescue! They built a new home for the family, and added a 3rd floor to the new house. There were rooms for all the kids, as well as a big master bedroom for the couple in which to relax. They also added a music room, library/study room especially for the kids. Don't marry because you are miserable. Don't philander because you think you are irresistible. Don't associate with people you can't trust. Don't cheat. Don't lie. Don't pretend. Don't dictate because you are smarter. Don't demand because you are stronger. Don't sleep around because you think you are old enough and know better. Don't hurt your kids because loving them is harder. Don't sell yourself, your family, or your ideals. Don't stagnate! Don't live in the past. Time can't bring anything or anyone back. Don't put your life on hold for possibly Mr/Mrs Right. Don't throw your life away on absolutely Mr. Wrong because your biological clock is ticking. Only a price to be paid for some of life's more hasty decisions. Don't bring another life into this world for all the wrong reasons. Don't abandon your responsibilities but don't overdose on duty. Don't live life recklessly without thought and feeling for your family. Don't commit when you are not ready. Don't keep others waiting needlessly. Go on that trip. Don't postpone it. Say those words. Don't let the moment pass. Do what you have to, even at society's scorn. Take care of yourself. Don't wait for someone to take care of you. Don't be afraid. Don't lose your capacity to love. Don't lose faith in your God. Don't grow old. Just grow YOU! And my current favorite (and signature in my emails): "Kiss slowly, laugh insanely, love truly and forgive quickly. Life is too short to be anything but happy!" New Year’s Eve was an especially busy time. 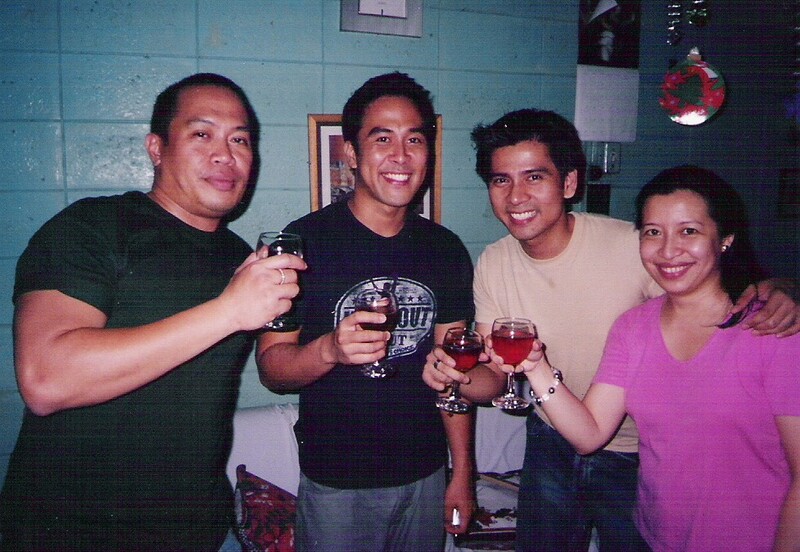 Busy with chores like cleaning the house, tidying up, etc., but most especially with preparing food for Media Noche. For the first time, have good friends coming to celebrate with me and the kids. So aside from my brother Jon and the kids, we had guests Dan, Ben and Floyd. Our New Year’s Eve spread consisted of lengua, salad (greens, parmesan cheese, mango, walnuts, grapes, pork strips and vinaigrette), ham, queso de bola, bread, putong ube/queso, leche flan, cassava cake, ice cream. After a hearty dinner, there was hot choco for the kids and brewed coffee for the adults. Now is it any surprise why my clothes fit tighter again?!?! When the clock struck 12, we were outside watching the fireworks display. Covering our ears from the noise, and our nose from all that smoke! But then, this happens just once a year so what the heck! We later brought out some wine, toasted to the year and the one just beginning… then we each started saying what we wished for the others… Taking into consideration what each of them went through the past year, here’s what I wished them. Browning's words best summarize my thoughts as we enter the New Year: "The year is closed, the record made, the last deed done, the last word said. The memory alone remains of all its joys, its griefs, its gains. And now with purpose full and clear, we turn to meet another year". HAPPY NEW YEAR!! !